As Starship once sang, “We built this original programming and video content hub on rock and roll!” (Something like that, wasn’t it?) Well, today you’ll notice a new top-level navigation on Last.fm dedicated to exactly that. Alongside Music, Radio, Events, Charts and Community, look for a fabulous new content feature we’re calling Originals, which aims to shine a light on the wealth of intimate artist experiences we’ve generated over the years here at Last.fm, and continue to create every day. For some years now we’ve strived to find new ways of bringing you closer to the music by means of video and editorial content – from the hundreds of sessions we’ve filmed in our New York studios, to our intimate Live in London shows and festivals around the world. Up to now though, we haven’t made it easy for you to find that content on Last.fm, and we felt the best way to fix that was to create a new section of the site where all this stuff would live. And lo, Originals was born! There you’ll find sessions, studio performances and interviews with established names such as Coldplay, Noel Gallagher, The Shins, The Temper Trap, Norah Jones, Snow Patrol and Wilco, as well as beautifully shot films from the hottest emerging talent around the world. We’re really proud of our sessions at Last.fm, so we’re launching Originals with two very special new recordings. 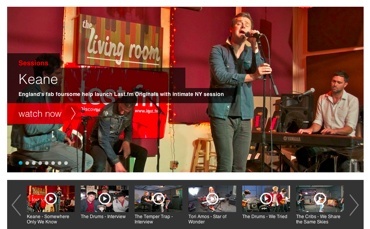 In New York, where the Last.fm team are old hands at capturing all the best music on camera, we were joined for an exclusive and intimate session by Keane. Watch them performing songs old and new (as well as answering your questions) here. The London team celebrates the launch of Originals by showcasing phenomenal new UK indie rockers Bastille, who treated us to a sublime session aboard Lightship 95, a floating recording studio on the River Thames. Watch it here. It’s not all videos and live performances though. On Originals we’ve also gathered together some of the editorial pieces you’re used to reading elsewhere, including the Hype Chart, Tag of the Week and New Releases blogs that were previously dotted across our various platforms. In short, Last.fm Originals is the place watch, read about and listen to the hottest – and biggest – new music happenings out there! Please take a look around – we really hope you like the latest addition to the Last.fm stable! Do you have robot ears? Wish I could actually log on at all. Service keeps refusing to link up.